Share the best chocolate available. When you need to make a big impression, send the very best of the best from Godiva®. Our executive selection boasts a delectable variety of Godiva® favorites. To be enjoyed and savored morning, noon or evening, this lavish gift basket features robustly flavorful Godiva® premium roast coffee, along with dreamy milk chocolate and dark chocolate cocoa. Something for everyone! 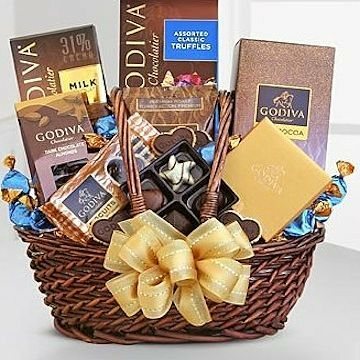 This basket includes the following: Premium roast coffee, milk and dark chocolate cocoa, Godiva® heart shaped chocolate biscuits, dark chocolate almonds, 31% cacao milk chocolate bar, Godiva® wrapped assorted chocolate truffles and a 4-piece gold ballotin of assorted chocolates.